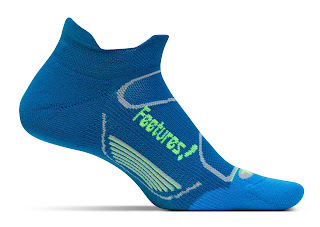 Purpose: The Feetures Elite Light Cushion is meant as a lightweight, thinner, performance running sock. They are good for decent temperatures as they are both wicking and decently ventilated. I have not had any issues with excessive sweating or heat in these socks. They may not do well in extreme cold given the thinner material, but have worked well for me in temperatures below freezing to above 100 degrees (Fahrenheit). The Light Cushion is available in no show, low cut and mini crew. I prefer the no show tab for a more minimal sock and that is the only version I use. Fit (Arch): This is the important part. The arch has additional material (called Power Arch) that wraps the midfoot to help hold the sock on the foot. This does put some minor extra pressure on the arch that does not irritate me but to anyone who is sensitive to high arches in shoes may want to try these on first. For me, the arch pressure creates a bit of a proprioceptive cue for my medial arch muscles to fire (this is just personal experience). Overall, Feetures has great compression in specific places to help hold the foot without being too tight overall. The wrap around the toes can be a little tight at first on the big toe (pulling laterally), but I got used to it. Feetures have an asymmetric fit with right and left specific socks (so look before you put them on). The heel fit is spot on and I have never had any slippage issues even during +20 mile runs, races or workouts. Cushion: As mentioned, the Light Cushion is on the thinner side. I prefer this as it gives me a little more room in all my running shoes, especially in the toebox. There is additional material under the metatarsals and the calcaneus (forefoot and heel) to provide "cushion" (a relative term since the shoe is more likely to provide cushion than the sock). The material is cushioned enough that I have not had any hot-spots or rubbing from any of the shoes I have worn with these socks. Materials/Durability: Materials used are high quality. No cotton is used, instead a combination of Nylon, Lyrica and Spandex. I have put many miles on each of my pairs and have seen no durability issues. No seams are loose, no tears are present and the fit has remained consistent (snug) throughout the life of each sock over a year of use (multiple pairs). A merino wool version is available, but I have not tried them yet. Colors: A variety of colors are available from black, white to neon colors. Conclusion: The Feetures Elite Light Cushion No Show Tab socks have been durable, performance orientated, well fitting socks. They have been my main pair of socks for quite some time now. Although a bit expensive (as all performance socks are) at $15 a pair, they are well worth the investment. These socks were a personal purchase from Foot Traffic Running Store in Portland, OR. I make sure I have at least a weeks worth of running on a pair of socks before I review them. The Feetures Elite Light Cushion is my go to sock and I have been using many pairs for over a year. Please head down to your local running retail store to check them out.